How cute is this set from Ellie Activewear?! The navy floral is just the perfect choice for me. 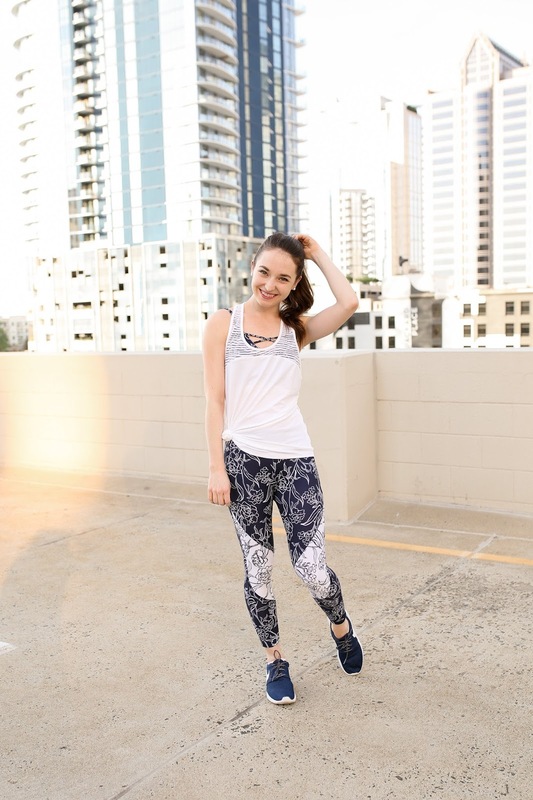 If you have not heard of Ellie Activewear before, it is a subscription service where you pick one of three activewear sets of a top, sports bra, and leggings, every month for $39! I also wanted to share some thoughts I have had throughout the week switching my evening workout schedule to early mornings. I decided last week that I wanted to give it a try, just to see how it goes. I ran a poll on Insta stories and Twitter, and I got some really encouraging replies from readers and friends! I usually workout sometime after work before 7pm or so. I sometimes feel like I don't have much time in the evening after a workout, some nights eating dinner close to 9pm. I also typically feel rushed in the morning, mostly because I just have trouble getting out of bed. To the point that I get for ready for work in about 20 minutes. So I wanted to see if I feel more ready for the day if I workout in the morning, and wondered how I would use my time in the evening that is usually spent going to a workout. I have always been such a night owl, so the sleeping schedule was the main thing I was worried about. I typically go to sleep a little before midnight and wake up at about 7:15am, to be at work by 8:30am. I don't think I made much progress with it in my first week, but I'll get there! The first Monday, I started out with a 5:30am barre class. I was shocked that getting out of bed that early was fairly easy. I think I was mostly motivated by the $20 no-show fee I would have been charged if I fell back asleep....whatever works right? I was done with class at 6:20am, which is about an hour earlier than I typically even wake up! I felt great after class, and even went into work early. After work, I spent some time at the pool and cooked dinner with my boyfriend. I felt a lot more productive during the day, but I was very tired by about 10pm. The next day, I went to a 5:45am hot yoga class. I managed to shower (and wash my hair, which I never have time to dry in the morning) by the time I am usually just waking up. However, I was very tired that day going into work. Wednesday morning, I planned on just working out in my apartment gym, but I did not really get enough sleep, so I decided to rest. I did still wake up a little earlier, ate breakfast and drank more water than I normally would. I typically eat some breakfast at my desk after I get into work, and drink coffee before water. So I think that one morning showed me I could create some healthier habits by simply waking up a little earlier. Thursday morning, I got back to it with a 5:45am aerial class. I definitely did not sleep enough, but having some cold brew coffee waiting for me in my car definitely helped me feel alert getting into work! And like the other days, I was very tired about 10pm again. Throughout the week I was still going to bed around 11, which I know is not the best idea. But I didn't really notice it until Friday morning, I went to a 6am barre class. I felt great through the morning but reallyy wanted to take a nap in the afternoon. However throughout the week, I felt like I got a lot more done after work in the evenings. I even cleaned my apartment one evening, I never feel like I have time to do that during the week! The following Monday, I went to another 5:45am class, and I think after the first week, it felt more normal. Similar to other days, I was a little tired going into work. But I wasn't very tired during the day at all. And after work, I was able to take some outfit photos. I have photo shoot days for outfit posts once every few weeks. When I worked out in the evenings, I would either skip a workout on photo days, or do a later class like 7:30pm. So it was nice to still be able to get a workout in and get blog work done, and not have to chose between them. Lastly, I went to a 6am HIIT class yesterday. I felt very productive during work but tired right when I got home. But overall, I like the new schedule so far and plan to continue!